THE MORNING LINE ‣ As we wrote about in yesterday's article, it's pledge week at MUG. Thank you for supporting handcrafted, ad-free content. 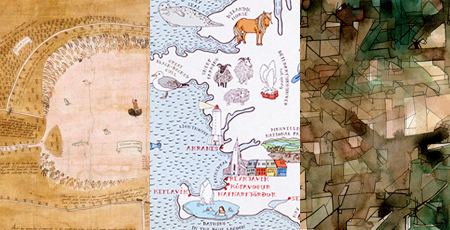 Mapping Brooklyn is a show at the Brooklyn Historical Society, in which artists work with maps in interesting ways. 71 Square Miles, by Jennifer Maravillas, uses paper garbage from every block in Brooklyn to create a map of the borough. A History of the Twentieth Century in 100 Maps by Tim Bryars and Tom Harper may sound like a gimmick but it turns out to be a fascinating lens for time travel. The imaginary geography of Emily Garfield's pen and watercolor maps may be more compelling than charted locales. Maps: their untold stories by Rose Mitchell and Andrew Janes is an engaging cartography (well, seven centuries' worth) from the British National Archives. Save money on NYC hotels by not staying in them: NJ Hotels Near NYC with transportation options into the city. Maps, a charmer by Aleksandra and Daniel Mizielinski, is aimed at kids but anyone would like these playful pictorials. Clarification: In yesterday's MUG, when talking about former local competitors such as Digital City and Citysearch, we also included the Times' New York Today. To be clear, we were referring to the site launched in the mid-1990s, which is indeed no longer with us. In 2013, the Times launched an online column by the same name, which is still going strong.